When we come to Mass and hear the readings, you’re probably aware that they have a three-year cycle, with year A covering St Matthew’s Gospel, year B St Mark and Year C St Luke. St John’s Gospel gets fitted in at different points over the three years. You may also be aware that the first reading is then picked to somehow relate to and complement the Gospel, whilst with the second reading we gradually read through the various other books in the New Testament. Some readings are more easily forgotten, whilst others are more memorable. For some reason, today’s first reading sticks in my mind, with the scribe Ezra standing on his wooden dais. (If you’re wondering what a dais is, it’s a platform you stand on to address people.) Maybe the imagery, and the unusual word “dais” are the reasons why I remember it. But the reading itself, and the Gospel too, can teach us a few important lessons about the importance and sacredness of Sunday and also the Mass. What we hear first is that the people are all gathered together in solemn assembly. Ezra is not just erecting a soap-box in the market-square and asking the passers-by to listen. They are gathered to hear the Word of God, contained in the Law. What is the Law? The Jews didn’t regard every book in the Old Testament as being of equal value. Just the same as we regard the Gospels in the New Testament to be more important than all the other books, so the Jews considered the first five books of the Old Testament, Genesis, Exodus, Leviticus, Numbers and Deuteronomy, to be the most important part. So it says that when Ezra opened the book, all the people stood up. It’s a bit like the fact that when we celebrate Mass, we sit for the first reading, psalm and second reading, but then we stand for the Gospel. We stand to attention and we stand as a sign of respect. The other readings have been predicting Christ or about Christ, but now we hear the actual words and actions of Christ. The book resting here in the pulpit is not a Bible, it is a Book of the Gospels – it doesn’t contain all the readings, the same as the book on the lectern down there – rather it contains just the Gospel readings for the Sundays and feasts of the Church’s year. Unlike the Lectionary, it is also kissed and, on Sundays, incensed, as further signs of honour and respect. These are things to remind us of how important the Gospels are to us. A few words about enthusiasm: in this country, there is sometimes a bit of an attitude of wanting to get Mass over and done with as quickly as possible. That’s not what we hear in the first reading. Instead, it says that Ezra, “read from the book from early morning till noon”; what is more, “all the people listened attentively to the Book of the Law”. Because we have a three yearly cycle of readings, there can be the danger of switching off when listening to the readings, because we’ve heard them before. In the past, you may have heard of priests telling people to be careful how they receive Communion, and not to let any small crumbs of the host fall on the floor. In the same way, we need to be careful that we don’t let any crumbs of the Word of God fall on the floor either. We need to listen in the same way as if we were hearing it for the first time. We need to do a similar thing with the whole of our faith. We need to celebrate it with the freshness of recent converts. To take it seriously and as joyfully as new converts. Ezra said to the people, “This day is sacred to the Lord your God. Do not be mournful, do not weep.” In the Gospel it says that Christ, “went into the synagogue on the sabbath day as he usually did”. Do we keep Sundays holy? Are Sundays different to any other day? 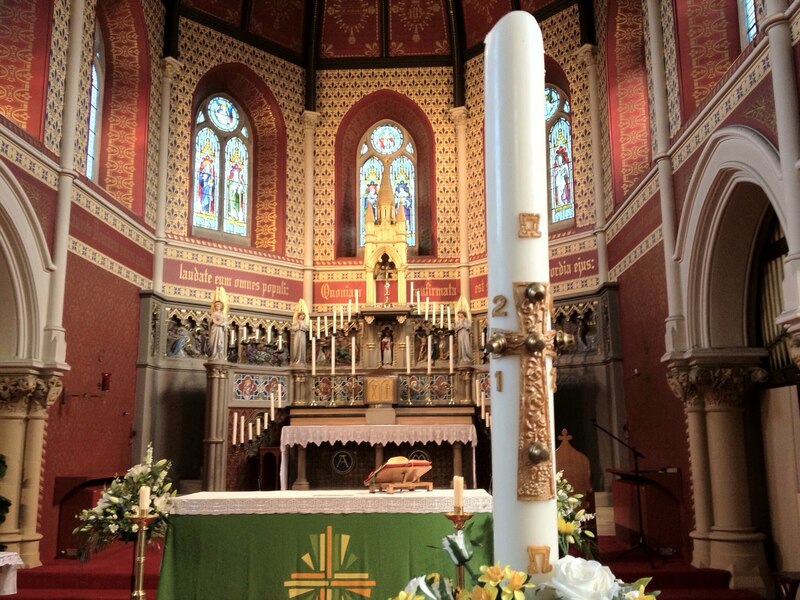 As well as going to Mass, there are of course other things that we can do to keep Sunday holy, the obvious one being making it a day of joy and celebration. Ezra said to the people, “Go, eat the fat, drink the sweet wine, and send a portion to the man who has nothing prepared ready. For this day is sacred to the Lord your God.” Sunday should be a day of eating the best food and drink, and also for sharing your joy with others. In a sense we do that in this parish by the Compassion Kitchen feeding the homeless on a Sunday. But it’s not the only way we can spread the joy of Sunday around us. What about inviting others round for Sunday dinner? I’m sure there are other ideas you could think of. So there’s a little project for you: how can I make Sunday truly a day of celebration? Surely the first answer is by coming to Mass, but after that, what do I do to make the celebration continue?